Mystery: The Moon giving off a Beam of Light! On May 1, 2018 Jason Maggard filmed the moon about an hour after sunset what he called as the most amazing moon rise ever. Indeed amazing but even more strange, it looks like the moon was giving off a beam of light straight up for about the first 30 minutes after rising on the horizon. Later on the moon came back to the moon as we know. 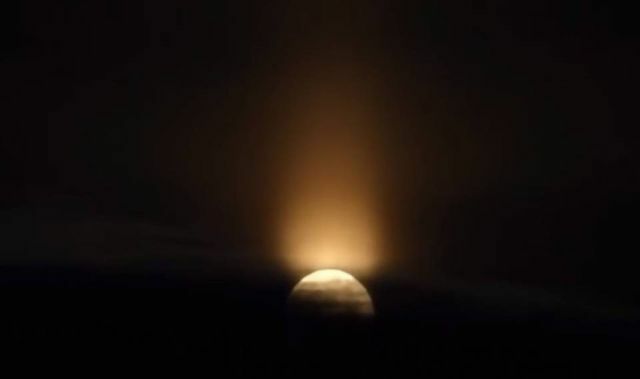 Since Jason is convinced that it was not the sun that illuminated the moon he wonders what could have been the cause for this rare sky phenomenon. Maybe you have an explanation for it?